There are probably a hundred people you’d rather spend one-on-one time with than any of your stakeholders. But that’s just the problem. When we sit down to get our designs out the door, we inevitably end up seeing anyone who gets in the way of that as an “enemy.” Which spirals into all sorts of negative experiences and interactions—pushing those people further away. It’s easier if you’re in a small business, or you’re just dealing one-on-one with a client. But for those creatives who need to navigate a complex corporate world with multiple parties involved, it pays to take a different approach. Instead of pushing those stakeholders further away and engaging only when it’s time to show something off, take the opposite view: draw them closer in. The results might surprise you. There are multiple qualities that separate good employees from great ones, poor performers from the top of the pack. But there’s a key one that you might not even know about. And not physical safety, either. Emotional safety. As the Harvard Business Review points out, Google conducted a massive two-year study of its employees and found out the best performers felt psychologically safe in their roles. Not only does that include feeling you won’t get fired if you make a mistake, but it encourages you to take risks. The science is pretty interesting here: Any time you come under threat at work, your old-school lizard brain interprets that as a physical threat. It shuts down the part of your mind that enables critical thinking. The more psychologically “safe” you feel, the more your brain is freed up to make more careful, considered decisions. “When the workplace feels challenging but not threatening, teams can sustain the broaden-and-build mode. Oxytocin levels in our brains rise, eliciting trust and trust-making behavior,” it says. This doesn’t just apply to the person sitting next to you. If you’re in a meeting with stakeholders, you’re essentially part of a broader team. There are plenty of ways to encourage psychological safety in that context—and among the most effective is spending regular one-on-one time with everyone in your stakeholder chain. Does that mean you need to spend multiple hours a week together? No. A cup of coffee every week or so will do it—but it’s important to understand why. The old-school method of management is adversarial and top-down. Your manager tells you to jump, you ask how high. They give you a deadline and you follow it, no matter how many extra hours you have to put in. It’s not conducive to good work. A combative relationship will never prosper, and that’s why modern managerial research has focused on several techniques managers can use to get the best out of their people. At the heart of this is the one-to-one meeting. That same Google research found employees love managers the most who take time out for them in those one to one meetings, and really listen to their problems. Research from companies like Soapbox have found similar results. Not just work problems, either—they want managers to care about what’s going on in their lives. During one-on-one meetings, listening is key. 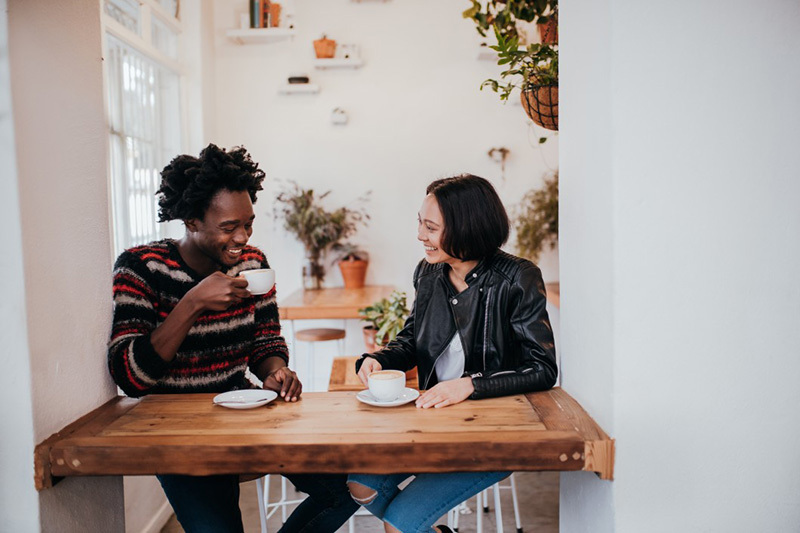 Try venturing out of the office to grab coffee with your employee—switching up the scenery may help you learn more about each other and build trust. Is it any wonder why these meetings result in more trust, and a greater willingness for people to get things done? But for creatives, that one-to-one time shouldn’t be restricted to just your manager. Instead, you should take the initiative and set up those regular catch-ups with your stakeholders as well. Of course, you don’t want to step over your product owner or project manager’s head. This isn’t about that. Instead, this is about cultivating relationships where you can get the best outcome for everyone. We trick ourselves into thinking that meetings are super important, because they’re on a schedule. But in reality, people come to meetings with all kinds of preconceived notions of what the meeting is about, what they want to get out of it, and their mental allegiances to whoever is in the room. Spending one-on-one time with stakeholders enables you to get them on side before you even step into a room. You’ve done the hard work already with them, so meetings become more about tiny details rather than convincing them to philosophically align with you. The art of persuasion is about understanding people. What or who do they care about? What do they want—not just in business, but in life? What’s going on outside of work that might influence their decision-making process? You can only really begin to understand these things once you spend time with someone. Then, when you know what makes someone tick, you can make decisions faster. Say for instance that a stakeholder is facing a challenging health problem with a family member outside of work. As a result, they might be rushed more than usual. If you spend more time repeating context, going over small details, they may be frustrated and less willing to agree with you on a specific direction. Had you not spoken to that stakeholder outside of the meeting, you’d never know. But the more you understand about their situation, the more you can tailor your presentations, your communications and your strategy around what’s most likely to resonate with them. Now, you might say, “that’s manipulation.” It’s only manipulation if you’re being secretive—but you’re not being secretive. In fact, you can be upfront about it. Even saying something like, “I know you’re really rushed right now, so I’m just going to give you the relevant facts now and then follow up later if you need to”. Just above I mentioned that not every decision is made in a meeting. I don’t know about you, but earlier in my career I’ve tried to push a project in the room without approaching each stakeholder first beforehand. It’s not that the reaction is muted. It’s that every specific person has mental hurdles they leap through every time they’re presented with an opportunity. I was wasting time in that meeting by not catching up with them individually to see what each of those hurdles were. This is why one-on-one time is so crucial. You begin to understand the context surrounding a colleague’s environment, and begin to know what’s going to convince them of your project’s worth. For instance, one stakeholder may have particular KPIs they don’t mention in a room together with others. Another might have more information regarding a separate stakeholder, who holds the keys to your particular idea passing. By meeting up with your stakeholders individually, you begin to understand the greater context of your situation. And by addressing their needs individually before you meet together, you’re at an advantage to get your strategy passed, address concerns in a room, and become more knowledgeable about what you’re trying to do. Plus, it might even save you from going down a wrong path or two. At the end of the day, spending one-on-one time with stakeholders isn’t just about the end game of getting your designs across the line. It’s about being part of a team. Too often we think of business-minded folk as our enemies or barriers, when instead they play just an important role as we do. Spending time with them one-on-one may help you realize that—and ultimately provide better outcomes for everyone.